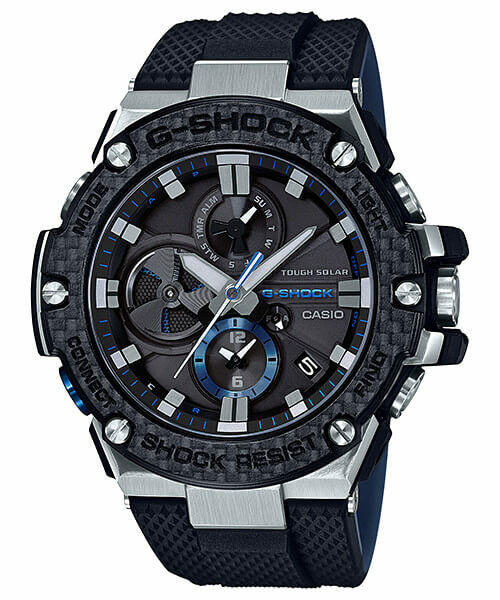 The G-Shock G-STEEL GST-B100XA-1A joins the GST-B100X-1A and the GST-B100TFB-1A 35th Anniversary Edition as the third Bluetooth-connected GST-B100 model with a carbon fiber bezel. Scheduled for a November 2017 release in Japan, the GST-B100XA-1AJF has a silver stainless steel body, blue-accented display, and a dual-layer resin band with a navy blue inner layer. 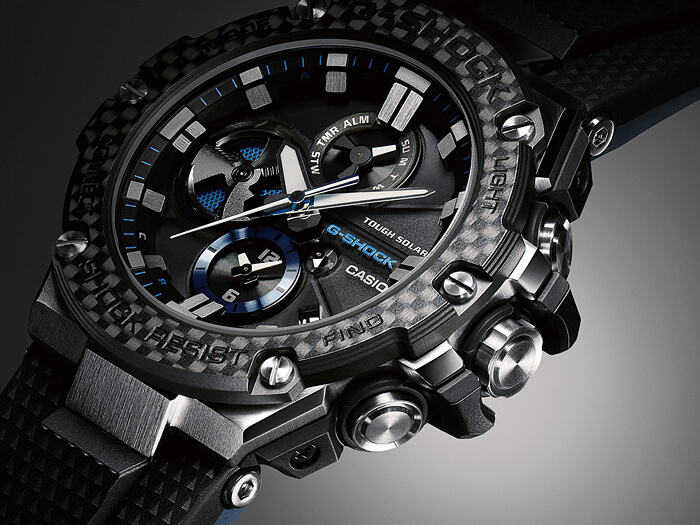 The bezel is made of a combination of Torayca carbon fiber material and proprietary Nanoalloy resin. The result is a highly impact-resistant material with a uniquely stylish carbon fiber appearance. GST-B100XA-1A has a full analog display with dual dial world time. The mobile link Bluetooth feature allows for automatic internet time-syncing through a smartphone connection, watch setting adjustment with the smartphone app, and a phone finding function. Other features include Tough Solar power, 1-second stopwatch (24 hour with split), countdown timer (24 hours), alarm, battery indicator display, power saving function, auto calendar with date/weekday display, and LED light. 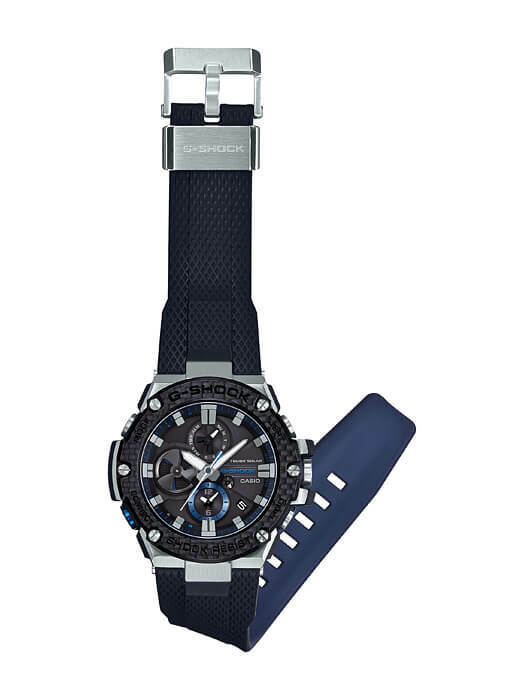 Like the other carbon fiber G-STEEL models, the GST-B100XA-1A has a sapphire crystal and stainless steel band keeper. With a list price of ¥80,000 JPY it costs significantly more than the standard GST-B100 models with stainless steel bezels. Update: Casio America announced availability of the GSTB100XA-1A in August 2018 with a list price of $600 USD.